WOU’s part-time, open distance learning (ODL) mode of study drew some 600 adult learners for the January 2018 intake, with many drawn by the affordable pricing, flexibility and learner support facilities. Director of Penang Regional Centre Teh Kim Kow welcomes the freshmen at the main campus. The majority attended the orientation organised simultaneously by the five Regional Centres in Penang (PGRC), Ipoh (IPRC), Kuala Lumpur (KLRC), Johor Bahru (JBRC) and Kuching (KCRC) on January 14th. Prof Zoraini Wati Abas delivered her maiden Acting Vice Chancellor speech at the orientation in Kuching while the Deans/Acting Dean of the four Schools represented WOU at the remaining four locations. They read out her speech and elaborated on the University’s ODL model. Prof Santhiram highlights the learning component in WOU. At the main campus, School of Education, Languages and Communications (SELC) Dean Prof Santhiram Raman participated in the orientation organised by PGRC. The other representatives were School of Humanities & Liberal Studies Dean Assoc Prof Dr S Nagarajan (KLRC), Assoc Prof Dr Wendy Bong Chin Wei (JBRC), and School of Business & Administration Acting Dean Prakash V Arumugam (IPRC). The academics were on hand to present the Dean’s List award. A total of 99 students were named to the Dean’s List for academic excellence in the ODL January 2017 semester, with 38 from PGRC followed by 31 KLRC, 15 JBRC, 9 IPRC and 6 from KCRC. Dr Nagarajan with the Dean's List recipients from Kuala Lumpur Regional Centre. The half-day programme also offered a glimpse of student life at WOU, acquainted the freshmen with key personnel, and provided practical help to log-in to student portal and the learning management system, WawasanLearn. In Ipoh, Ahmad Ramli Mohamed Ismail, who had enrolled for his Bachelor of Technology (Hons) in Electronics programme, led in the oath-taking while Dean’s List recipient, Amanda Fong Kim Yen, from the sales and marketing degree programme, talked about her learning experience at WOU. Prakash shares on the ODL model at the Ipoh Regional Centre. 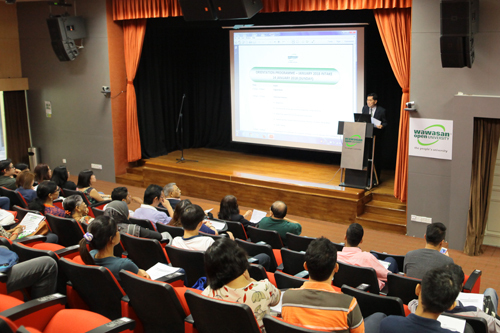 In Kuala Lumpur, 108 of the total 186 new students participated in the orientation. They were welcomed by Acting KLRC head Roshini Jesselyn Chandru, followed by Dr Nagarajan elaborating on the ODL model and presenting the Dean’s List awards. Dr Nagarajan addressing freshmen at Kuala Lumpur Regional Centre. Student representative N Muniandy Ramachandran from WOU’s Bachelor of Arts (Hons) in Psychology programme shared on student life at KLRC. Freshman Chan Huan Ling, newly enrolled in the Master of Education (TESL) programme, led in reciting the students’ pledge. Chan leads the new students in the oath-taking ceremony. The orientation culminated with a fun Treasure Hunt exercise to encourage interaction and enable the students to explore the facilities and services of WOU.